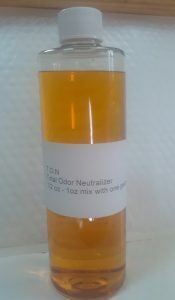 PRODUCT DESCRIPTION: Odorless concentrate added to your chemical tank mix used to eliminate noxious chemical fumes. Years ago this capability was important because so many concentrates had strong odors. 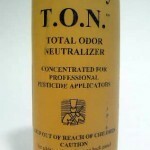 Today's products are more refined and odor has been all but eliminated. But if you have a particular concentrate you like to use but don't like the smell it leaves in the home or yard, add some TOC and you'll see a great reduction in all associated smells. WHERE TO USE IT: In any tank mix like a pump sprayer, back pack sprayer, spray bottle or power sprayer. You can also mix 8 oz per gallon of water and use it as an odor neutralizer. MIXTURE RATE: Add 1/2 to 1 oz per gallon of mixed insecticide solution. Each Vial contains 1 fluid oz. WHAT TO USE IT WITH: Can be mixed with any pesticide including standard insecticides, herbicides or fungicides and it will not affect the way the chemical works.